The 1898 Lilies of the Valley Egg is made of Gold, green-gold, translucent rose pink and green enamel, diamonds, rubies, pearls, rock crystal and watercolor on ivory. The gold Lilies of the Valley Egg in the art nouveau style is enameled translucent rose on a guilloche field and supported on four green-gold cabriolet legs composed of overlapping leaves veined in rose-cut diamonds. The Egg is surmounted by a rose diamond and cabochon ruby Imperial Crown set with two bows and quartered by four lines of rose diamonds and decorated with lilies-of-the-valley in pearls and rose diamonds. When a gold-mounted pearl button at the side is turned the surprise slowly rises from the base, and spreads into three portraits of Tsar Nicholas II in military uniform and his first two daughters, the Grand Duchesses Olga and Tatiana. A turn in the opposite direction automatically folds and returns the miniatures back into the interior of the Egg. The date, April 5, 1898 is engraved on the reverse of the miniatures. The miniatures are painted on ivory by Johannes Zehngraf. 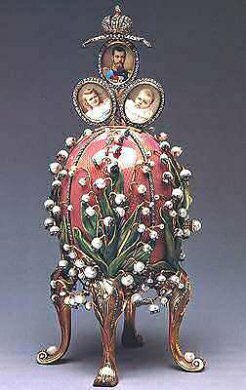 The Lilies of the Valley Egg, an 1898 gift from Nicholas II to Empress Alexandra Feodorovna is another of Fabergé's stunning works of originality. 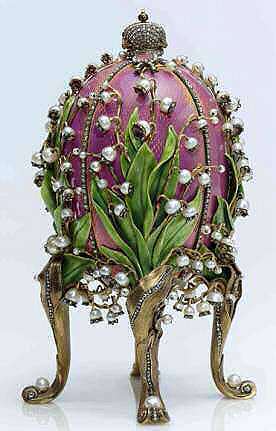 Designed in the Art Nouveau taste of which the Empress was so fond, the Egg, enameled in a lush rose-pink against a gold ground, is supported by multi-colored gold diamond-set leaves. From this quadruped metal base, the egg itself appears to have been dropped into a patch of lily-of-the-valley, with green enamel leaves, engraved gold stems, and pearl flowers, the petals marked by tiny rose-cut diamonds. Every spring, Alexandra had the rooms of the palaces filled with beautiful floral bouquets. 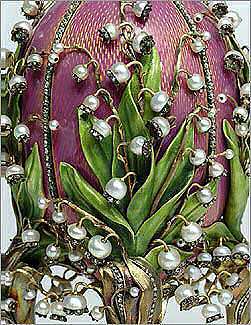 Fabergé knew that pink was the favorite color of the Empress, and lilies of the valley her favorite flower. As well pearls were her favorite jewels so the combination in this Egg would have delighted her. A similar design was used in the Lilies of the Valley basket. 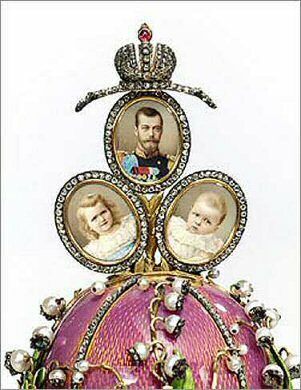 The basket so enchanted alexandra that it sat on her desk until the October Revolution of 1917. Ca. 1927 one of the nine Eggs sold by the Antikvariat, Moscow to Emanuel Snowman of Wartski in London. 1934 bought by Charles Parsons, London. Sold back to Wartski. Bought by a Mr. Hirst, London. 1948 sold back again to Wartski. 1979 sold by Wartski, together with the 1897 Coronation Egg, to the Forbes Magazine Collection, New York. February 2004 bought from the Forbes' family by the Vekselberg Foundation/The Link of Times Foundation, Russia.